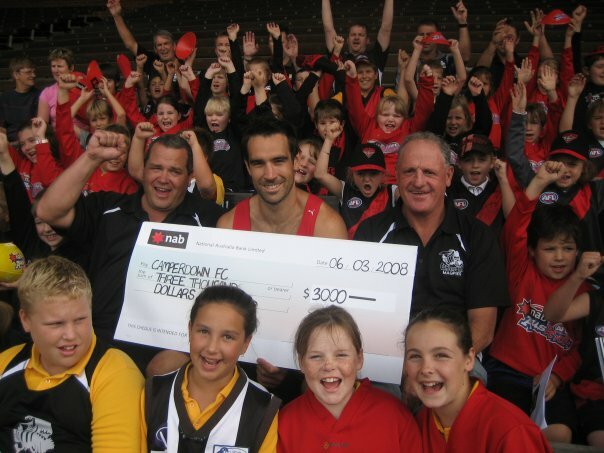 Every time a player kicks a nine-point goal in the NAB Cup (AFL pre-season competition in Australia) NAB generously donates $1,000 back to the player’s nominated junior club. 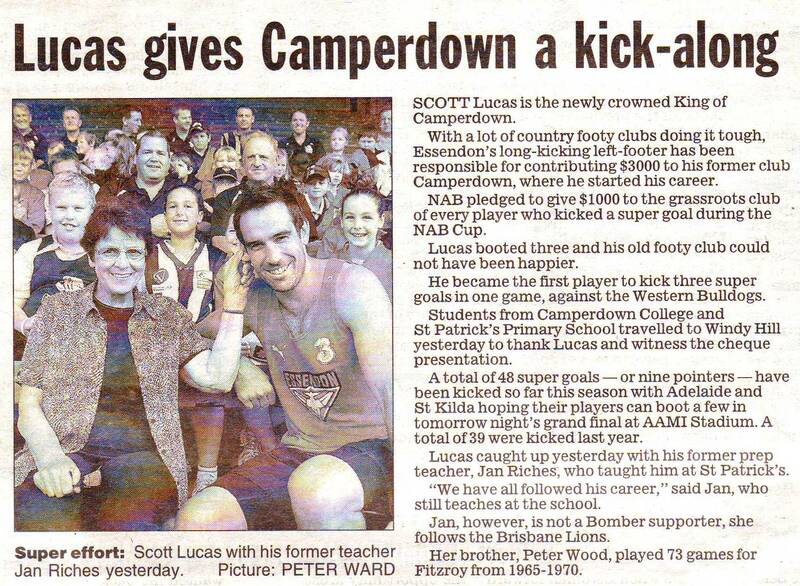 As a result of Scott Lucas from Essendon Football Club kicking three of these “NAB Supergoals” (the first time a player had ever kicked three in the one game) we at ESP pitched the idea of a special presentation of the $3,000 NAB contribution to Camperdown Football Club at Essendon Training on Thursday 6 March, 2008. One of NAB’s key objectives was to obtain positive PR in country towns, not just metropolitan centres. 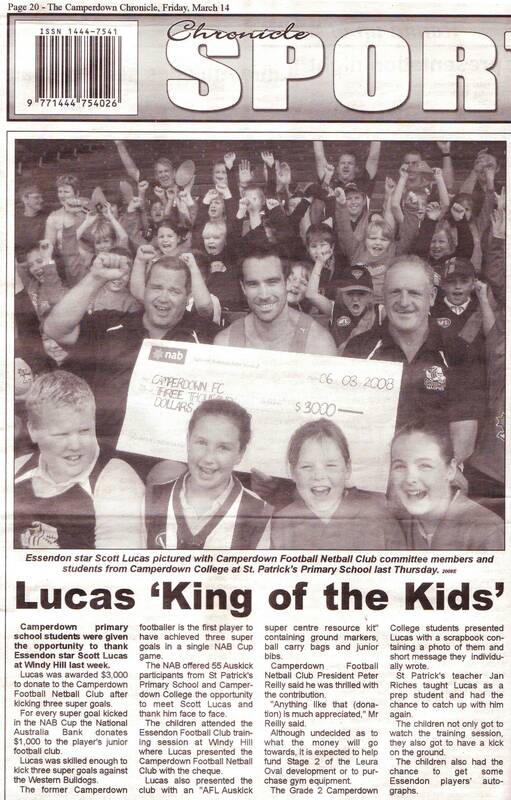 Scott Lucas’s junior club, Camperdown is located in a large key regional area of Warrnambool in Victoria, so this presented a fantastic opportunity to obtain some coverage for NAB in this area. 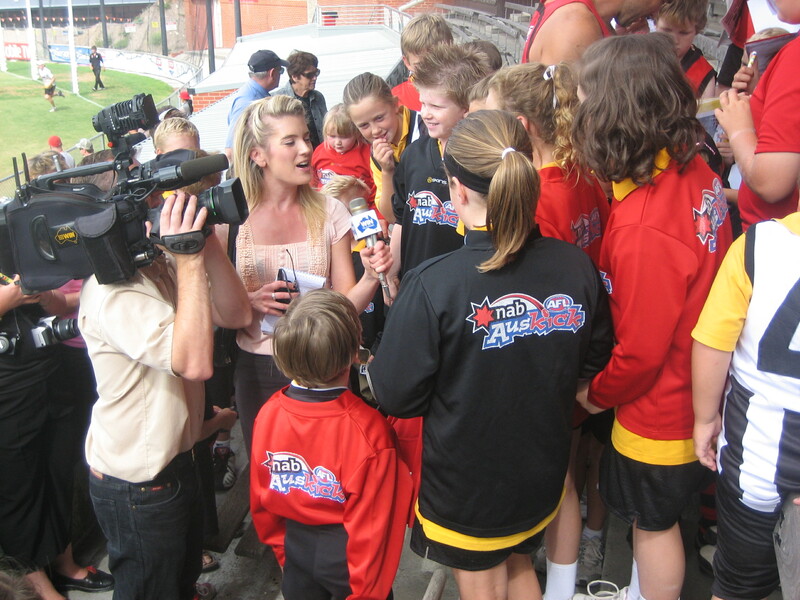 Once ESP had secured a time for Scott Lucas to have a photo shoot and interviews, we arranged for Herald-Sun (Australia’s highest circulated newspaper, located in Melbourne) and WIN TV to be in attendance to capture this presentation with representatives from Camperdown Football Club being transported (thanks to NAB) to Essendon Football Club for the occasion, alongside 60 lucky NAB AFL Auskick participants who hail from Camperdown. Furthermore, having spoken with regional papers, such as Camperdown Chronicle we had pre-arranged coverage I would then email to them immediately after the shoot. In addition, we arranged for Scott Lucas to present the club with its “NAB Super Centre Resource Kit”, containing essentials for the upcoming NAB AFL Auskick season, such as ground markers, ball carry bag and junior bibs. Every one of the 2,500 NAB AFL Auskick centre’s nationwide received these kits, and was NAB’s key component of their AFL sponsorship. 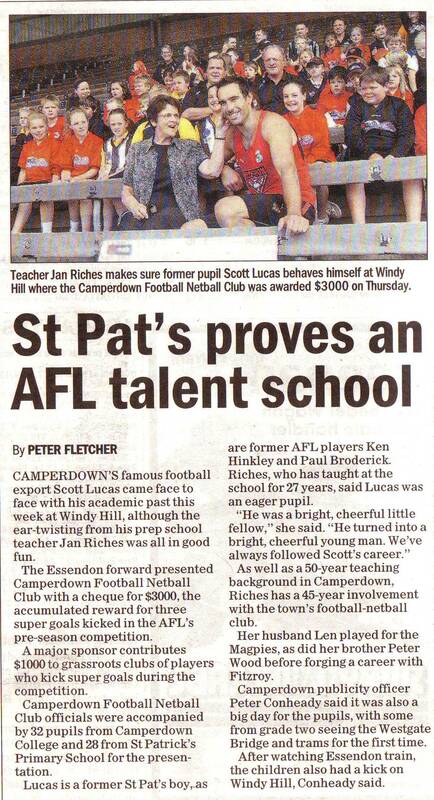 The result: WIN TV showed the Scott Lucas story as one of the leading bulletins, third story in. 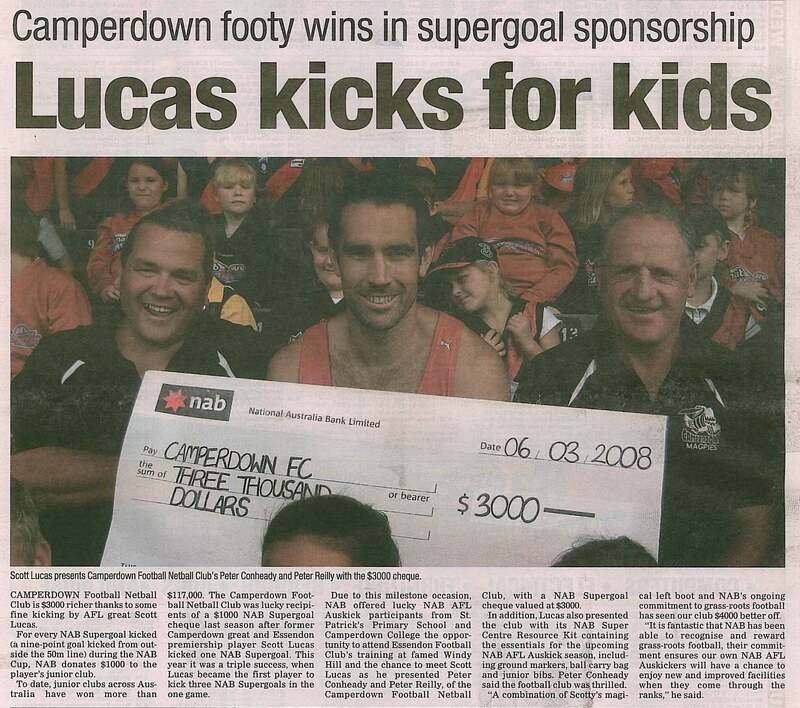 There was footage of the NAB Cup game, when Scott Lucas kicked his three NAB Supergoals and footage of the NAB Supergoal cheque being presented. Articles in: Herald-Sun; Corangamite Extra (word for word from our media release too! ); The Standard (highest circulated paper in the region) and the Camperdown Chronicle. This entry was posted in AFL, NAB, Publicity. Bookmark the permalink.